President Donald Trump said on Tuesday that Rep. Ilhan Omar's (D., Minn.) apology for tweets widely condemned as anti-Semitic was "lame," saying she should consider resigning from Congress. 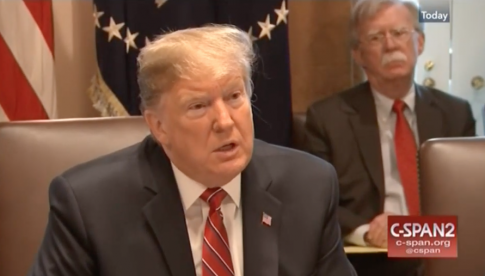 "One other thing I might want to say is that anti-Semitism has no place in the United States Congress, and Congressman Omar is terrible [for] what she said," Trump said. "And I think she should either resign from Congress or she should certainly resign from the House Foreign Affairs Committee. What she said is so deep seated in her heart that her lame apology – and that's what it was, it was lame and she didn't mean a word of it – was just not appropriate." "At a minimum, she shouldn't be on committees, certainly that [the foreign affairs] committee," Trump added.